Sweden’s world class football striker Zlatan Ibrahimovic changed his relationship with media when he launched his own app, “Zlatan Unplugged“. Instead of just talking directly to journalists, a lot of quotes in articles today are from statements in his app. And now another football icon, Cristiano Ronaldo, ups the ante by launching his own social network Viva Ronaldo (Where my true fans belong…), complete with an app for iPhone and Android devices. 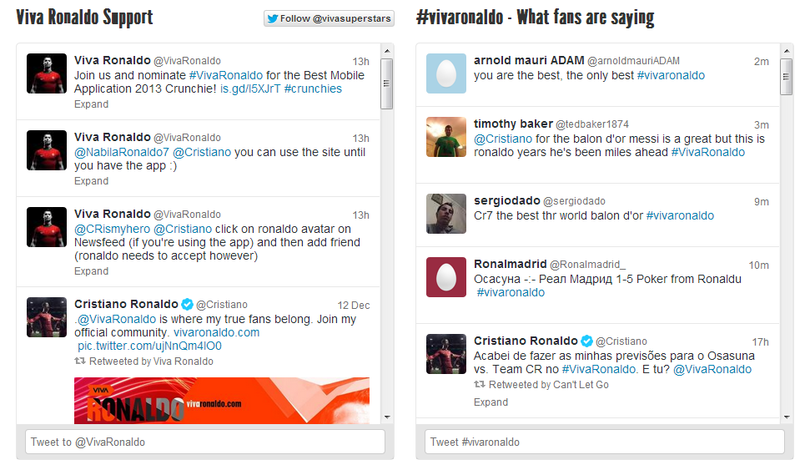 The community site features a stream of tweets from the official Viva Ronaldo Twitter account alongside tweets from fans who tag their tweets #vivaronaldo. I think it’s a nice feature to include fan tweets live on the site. In the app, you are able to interact with other fans, play games and win prizes and of course read updates and watch images and videos from CR7. And if you’re lucky, Ronaldo may even like your pictures. The Swedish local daily Sörmlands Nyheter (sn.se) today published an article with the headline “Ryanair pilots forced to fly free”. In the article, pilots describe how they get paid only for scheduled hours and not a minute more. If an aircraft is delayed, it means that pilots fly for free once their scheduled time has run out. “This is extremely stressful, especially in the evenings. Everyone wants to come home and if you are going to fly the next day you have to get some rest between flights. Landing too late means you don’t get to fly the next day and then we have flown without pay ang get no income day after. This forces you to make stupid decisions and is a major safety hazard. I doubt that passengers know that the person flying them sometimes do so without pay,” says one pilot who wants to remain anonymous in fear of getting sacked by the airline. The article describes the pilots’ dissatisfaction with current working conditions. In a follow up article, Ryanair’s Head of Communications Robin Kiely denied all claims from the pilots, claiming they were “rubbish”. In an email response to the paper, he also threatened to sue the paper if the statements from the pilots were published. “If you publish any of these claims, we will initiate legal action against your newspaper,” Kiely wrote. That seems like normal procedure at the airline, which just last week threatened to take legal action against British Channel 4, after a documentary about pilots’ concern over passenger safety. Apparently the PR strategy from Ryanair is to stop pilots from publishing any views on social networks (I blogged about it here in Swedish) and threaten to sue any media outlets that publish anonymous comments from pilots. That doesn’t sound like an airline that I would ever fly with. Universal McCann have just released the fifth installment of their global social media survey: Wave 5 – The Socialisation Of Brands. 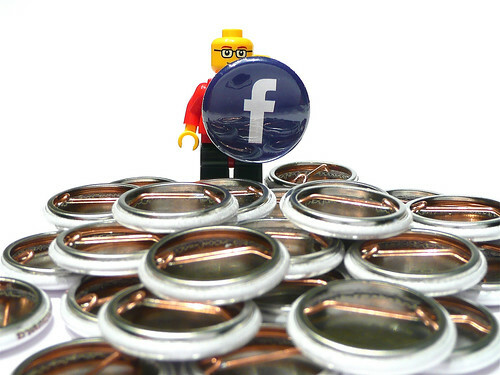 It is further evidence that social media continues to have a huge impact on brands. This time UM surveyed 37,600 active internet users (that go online every day or every other day) in 54 countries. Among all the graphs I found the one below to be one of the most interesting. It shows how many of the respondents that visited an official brand or company website during the last 6 months and the percentage is declining quite rapidly. From 85% to 75% in the last two years. It is clear that it is becoming increasingly difficult to get consumers to visit your company website and that brands (also) need to reach out to consumers on social media platforms. 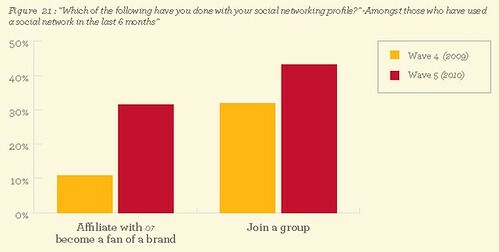 The percentage of internet users who follow or become fans of brands on social networks has increased from about 10% last year to about 30% in 2010. 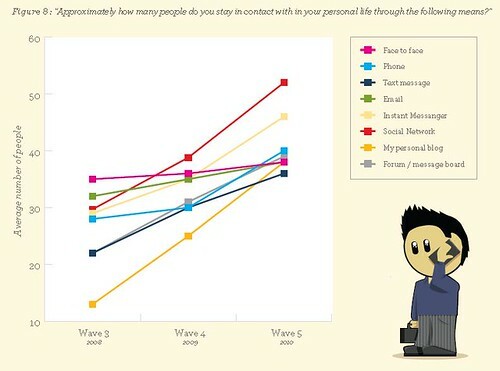 Another interesting conclusion from the Wave 5 survey is that face to face meetings is becoming the least used means of staying in contact with friends. Text messages is still used more seldom but is growing in importance. The entire report can be found below. The market research agency InSites Consulting has posted a terrific report about the global use of social networks. InSites surveyed 2,884 internet users in 14 countries and the report is a gold mine of interesting statistics. I have chosen to post two of the slides that I think are especially noteworthy. 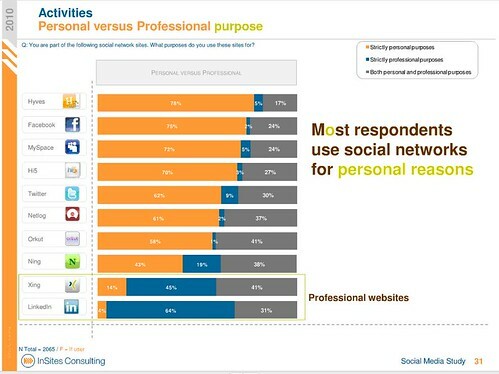 The first is a slide that shows professional vs personal use of different social networks. It is a clear difference in use of sites like Xing and LinkedIn on the one hand, and Facebook and MySpace on the other. 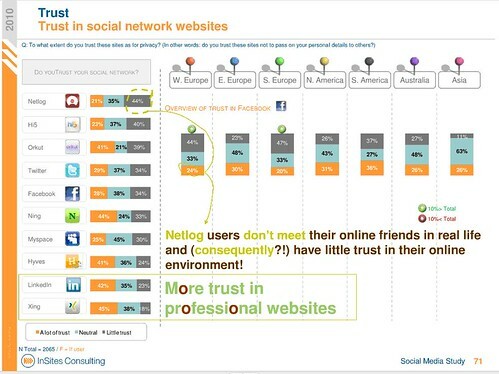 It seems that internet users have more trust in professional social networks than in ones used for personal purposes, with the exception of the Dutch site Hyves.nl, in which users also have a lot of trust. That might possibly be due to the fact that it is a local social network, but that is a guess on my part. Here is the entire presentation and I encourage you to check it out. It is quite possible that this trend will only increase with the growth in popularity in social networks. Research from the UK communications regulator Ofcom reveals that children as young as 8 years old are ignoring social networking site rules and creating their own site profiles. The research also showed that one in six parents didn’t know that their children were spending time on social networks. In the UK, 1.6 million teens age 13-15 have a Facebook profile. It seems reasonable to think that also several thousand children under 13 are on Facebook, although they aren’t allowed to register. 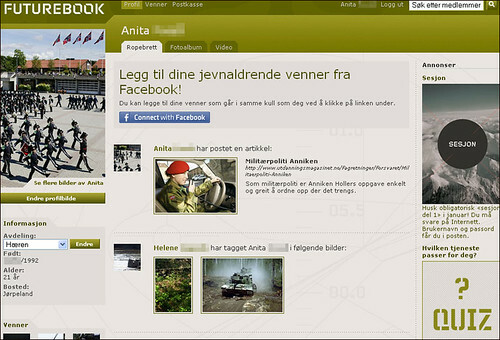 The Norwegian Armed Forces have launched a Facebook-like social network to recruit 17-year olds. The site called Futurebook is made up of 60,000 members that the Armed Forces added to the social network without their permission. The 17-year olds recently received a mysterious letter in which they were invited to some sort of fictitious reunion party. Among other things, the letter that promoted the site stated that “There are thousands of new photos published and maybe you’ve been tagged in some of them”. “Anyone going to Roskilde this year? Had been cool with a camp for people who actually know how to raise a tent”. Even the friends lists are populated with friends the teenagers don’t really know. – They steal your name. On other sites such as Facebook or Nettby, you would be thrown out for posting a fake profile. – We try to teach our kids that they should be careful online and then they get this thing thrown in their faces. It looks like they’ve published the profiles themselves but at the bottom in tiny letters it states that this is fictitious, says June Beth Rovik. Based on the comments about Futurebook on Twitter and on blogs,the site seems to create a significant amount of negative reactions. Many react to the fact that birth details for example are published and open for all members to view. Just because the Armed Forces could buy the personal details of all 17-year olds in Norway, doesn’t mean that they are entitled (morally) to hijack their identities and then post it online. That’s not the right way to create positive associations to a brand or organization. “Permission marketing is the privilege (not the right) of delivering anticipated, personal and relevant messages to people who actually want to get them. Creating an opt-out social network just seems to be a really really dumb idea, especially when the target group is teenagers. Tags: norway, facebook, army, futurebook, norge, facebook. Ping.